The Yocan Evolve Plus is a wax pen featuring an atomizer with dual quartz coil. It is powered by a 1100mah battery. It also has a wax storage container that is built-in for portability and easy transportation. This is a straightforward and simple wax pen that is perfect for first-time vape users. Here is a step-by-step guide on how to best use the Evolve Plus. 1. Load the device by twisting the mouthpiece. Remove the mouthpiece from the body, exposing the atomizer. 2. Expose the heating chamber by unscrewing the coil cap. Load the heating chamber with the desired concentrates. 3. Put back the coil cap on the atomizer and the mouthpiece should be screwed back. 4. Press the power button five times fast. You know that its active once the light illuminates around the button. 5. Draw and hit from the mouthpiece by simply pressing the power button while doing so. The Yocan Evolve Plus doesn’t have temperature control, which can be disappointing for some, but this feature makes it basic for first-time users. You can regulate the temperature on your Yocan Evolve Plus by pulsing the power button while you draw. So, instead of merely holding down the power button while drawing, you have to hold the power button down for at least 3 seconds, then release it for 1 second, holding it for another 2 seconds, and finally releasing. Doing so helps in maintaining an even temperature. It also prevents the heating coils from getting too hot. If you are a novice vaper, the Yocan Evolve Plus is perfect for you, and you can find many Evolve Plus for sale online today! Yocan Vaporizer Evolve Plus XL is generally better and bigger as compared to the first version, the Evolve Plus. The features include adjustable airflow, magnet connection, and quad coil atomizer, making it one of the best vape pens given its price point. It is capable of producing serious clouds, with a very hot hit. It’s a perfect device if you prefer quartz coils and something that can hold plenty of concentrate with its built-in jar that can hold about 1 gram of wax. The Evolve Plus XL is the updated version of the famous Evolve Plus. It is bigger when it comes to size and holds more wax. 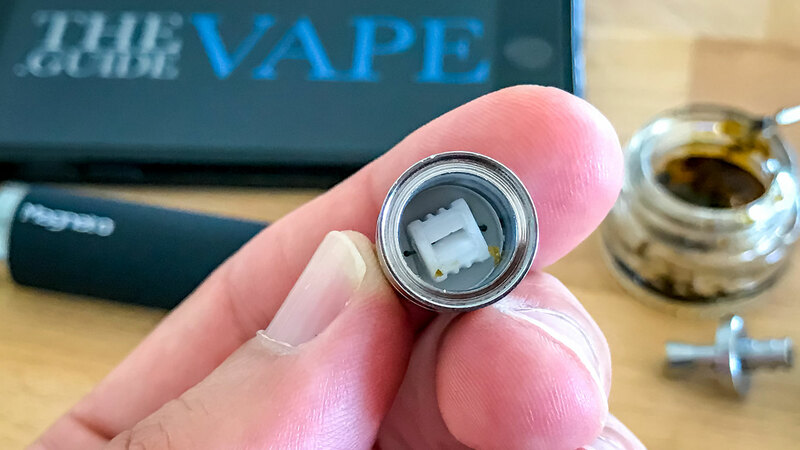 A great improvement of Evolve Plus XL that can’t be found in Evolve Plus is the battery and mouthpiece inter-magnetic connection, allowing easy taking off and reloading of the device. Evolve Plus XL allows you to hit in any manner you desire with its impressive adjustable airflow intake. On the bottom, you’ll see a compartment for storing your concentrates like the Evolve Plus. The Evolve Plus XL comes with a whole jar with a lid with 2 separate compartments inside. The Yocan Evolve Plus XL has 4 Quartz Rod Coil, allowing you to make giant clouds and strong hits. You can put plenty of shatter in the middle or you can put a few small balls on the rod coils. The quartz rod promotes a cleaner and purer vapor sticking with the original flavor and scent of the material. You can take advantage of these best features by checking Evolve Plus XL for sale today! Here is a step-by-step guide on how to best use the Evolve Plus XL. 1. Quickly click the button 5 times to open. 2. Place the material in the cartridge. 3. Press the button to start working. The first time you hold your Yocan Evolve Plus XL, you’ll notice the fatness of the vape pen which has a greater width than Yocan Evolve Plus. Evolve Plus XL glows in the dark because it comes with a luminescent option which is great for midnight totes. It also has a stronger battery with a necktie included so you can hang it conveniently around your neck making your vape sessions very accessible. quick, and easy. The Yocan Evolve Plus XL is the maximum version of Yocan Evolve Plus. The big improvement includes the adjustable temperature settings in Evolve Plus XL that are not available in Evolve Plus. Being able to adjust the temperature also gives you a better vaping experience, which means bigger clouds and stronger hits. For one thing, you can carry more material with the Evolve Plus XL because of its built-in jar or container. That is why the Evolve Plus XL is for an expert vaper. Enjoy the best features of both devices in terms of portability, durability, and convenience. Loading the material or concentrate is very easy with both devices. Also, getting them activated involves easy clicks of the power button. They always come handy whenever you need a simple or basic wax pen (Evolve Plus) or a heavy-duty atomizer (Evolve Plus XL). Experience vaping at a higher level with Evolve Plus XL with its more advanced and sophisticated features, ideal for experts and professionals in the world of vaping. But of course, if you want to become one of them, you might as well grab your Evolve Plus XL for sale online today! The Yocan Evolve Plus is perfect for beginners while the Evolve Plus XL is recommended for average users and experts. The former has basic features and simple operation, while the latter has advanced features yet convenient to use. If you want a vaping device with more loading capacity, then you can opt-in Evolve Plus XL, which has a greater width than the Evolve Plus due to its built-in container that can hold up to 1 gram of concentrate. Both are available at yocanvaporizer.com.